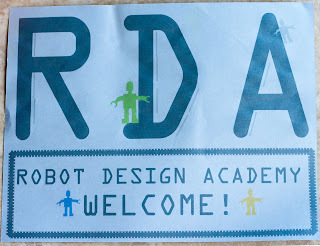 Welcome to the Robot Design Academy and the birthday party of my six-year-old son! Here’s a question for you? Which takes longer, throwing the party or blogging about it? Ok throwing it does, but blogging about it is a close second. To keep this post from being any longer than it is already going to be, I’m going to show you lots of pictures with minimal descriptions. Then I will go back in subsequent posts and break down the aspects of the party. If you have any particular questions make sure and let me know so I can include the answers in my posts. 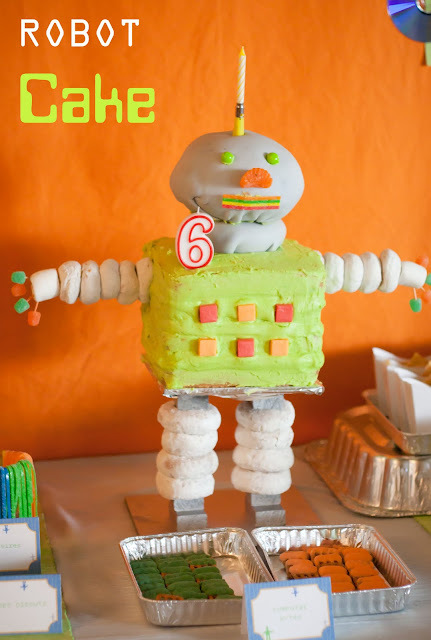 In this post, we also get to pretend that the party went off with out a hitch and I was completely ready when the doorbell rang for the first time instead of frantically decorating the cake. I will disclose the good, the bad, and the not-so-perfect in future posts if you would like. 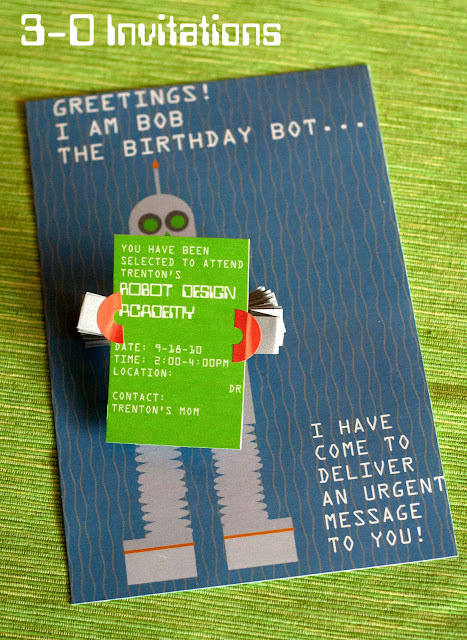 Birthday Bob the Robot delivered the invitation to our guests. I think this cake warrants his own post. Can you tell how we made him stand up? 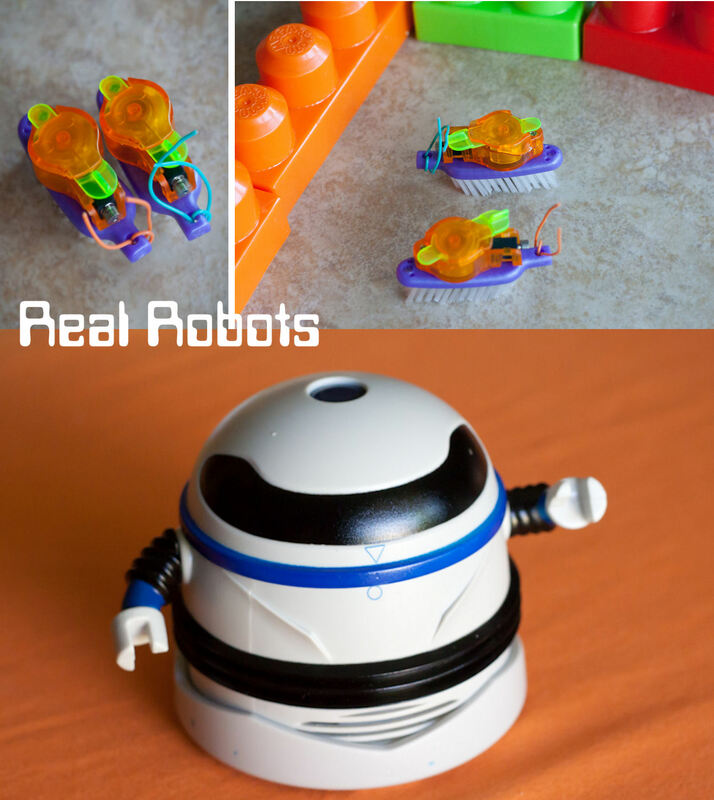 …and tested robots (bristlebots) on a racetrack. (This one just hangs out on the table and vacuums up your crumbs). 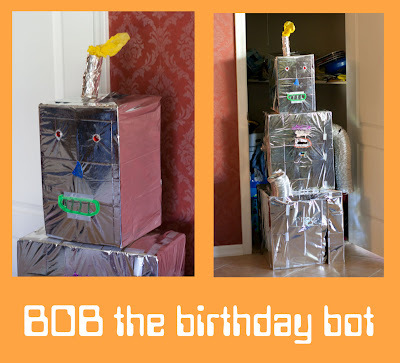 My 9-year-old was responsible for the construction and operation of our life-sized version of “Bob the birthday Bot.” He spit out clues to find coins and the coins could be inserted in exchange for presents. 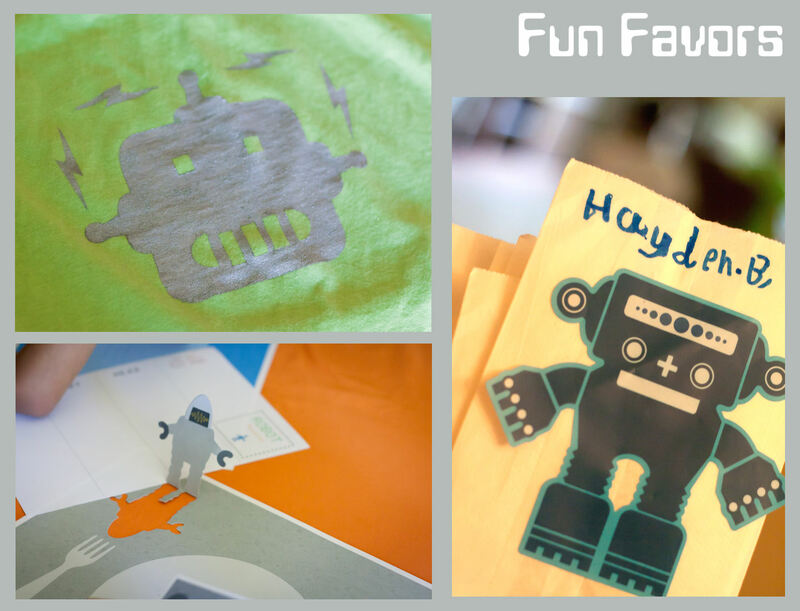 Guests went home with the prototypes they built, a hand-painted robot t-shirt (more on that later), their placemats that they decorated (more on those later), and candy from the table in paper bags with robot decals, specially selected and addressed by my son because it’s cuter that way and mom was running out of time to run the bags through the computer as she initially designed. The name badges I designed will be sent along with their thank-you notes, letting them know that they are officially Robot designers! 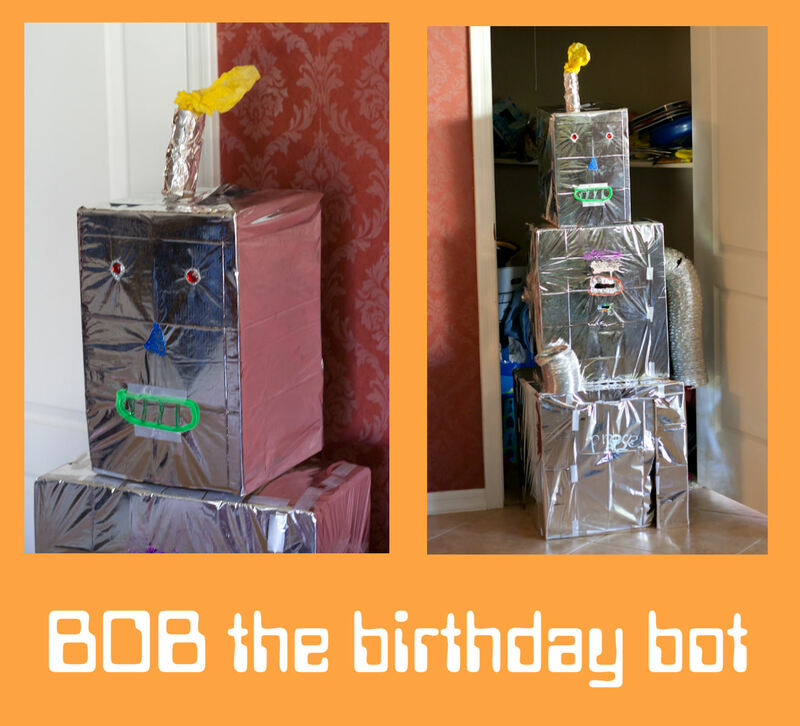 I think my son’s wishes for a cool party came true! I A.D.O.R.E. EVERYTHING about this party!!!! OMG!!!! Awesome!!!! Love the donut legs…& the sour wires??? SO cute in the cans. That is so fun!!! My son would love it!! Oh WOW — That is AWESOME Kendra!! I knew you would come up with something beyond amazing!! What a cool party. And that cake is fabulous! seriously so cute-everything turned out AWESOME! WOW! Kendra this is beyond amazing! A little boy's dream! SO, SO, SO creative! I love it! 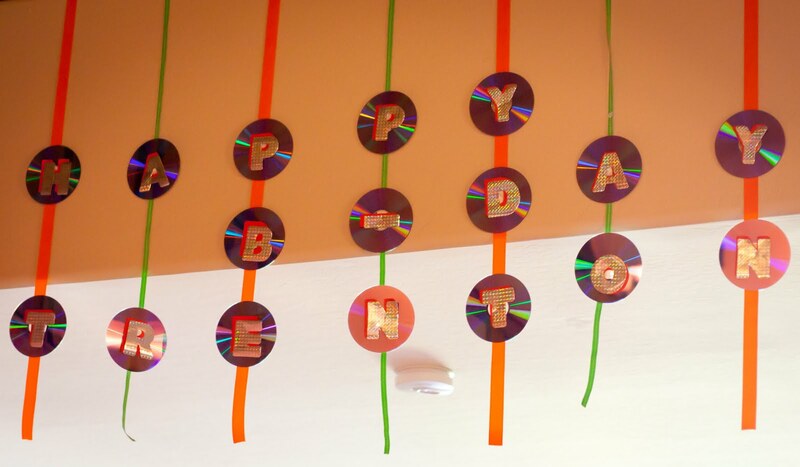 the CD bunting and the cake are just so great! Way to go Kendra!! My "E" was obsessed with robots when she was three and we stacked all of her gifts that year to make a big box robot — I still love the photo of her grinning ear to ear with her gift bot! If she'd had a party like this she would have been over the moon!! 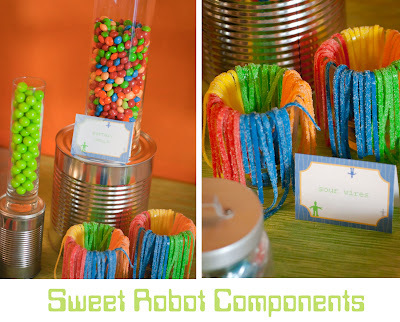 You did a fantastic job and YES blogging about the party takes as long (or longer) than making everything does!! Amazing! That's so neat – you did a great job! 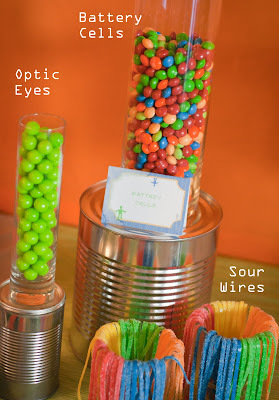 Sour wires? Kendra! So cute! I love the CD's and OF COURSE the invites are amazing…'cause that's just how you roll! And the nuts and bolts? Man. You are just a creative genius! Love all the activities as well. you always have the most insane ideas!! I loved your party! Thanks for sharing! 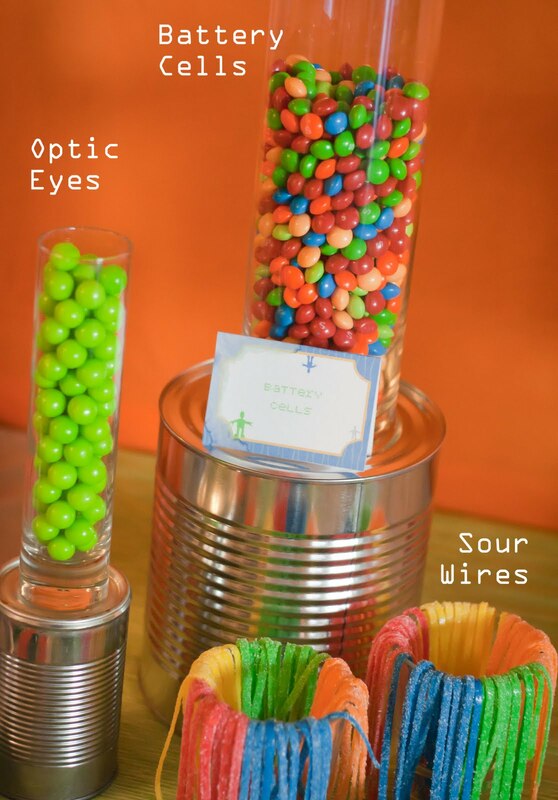 One q… Ive seen a few posts on how to hang the backdrop for the dessert table, but none of them seems too great to me… how did you hang up your sheet? My favorite part is the invites. Everything was so cute though! WOW! Everything looks amazing! I love the decor. 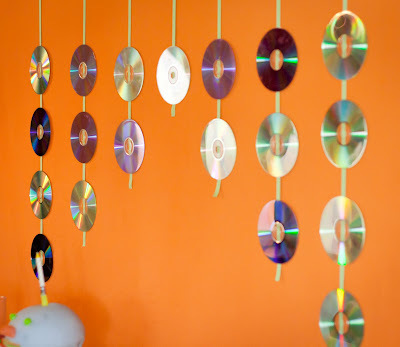 Those cds were a great idea! Thanks so much for such a fabulous party. I'll have to link to this in a future Roundup. It's amazing! Super cool. My Son would love this. 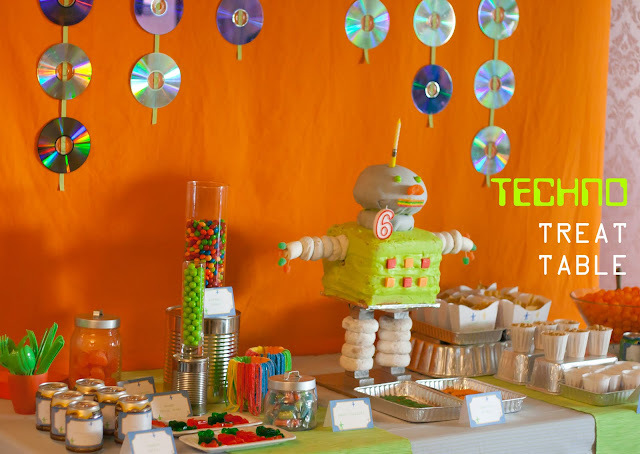 Great party theme… You did such an awesome job! The cake looks really professional! I KNEW you had this one wrapped up at CSI, you insane person you! 🙂 Great job! your first place at CSI is WELL deserved. how simply awesome. EVERYTHING about it. i know tons of work was involved. congrats!!! What an amazing party! You have a very lucky little boy! 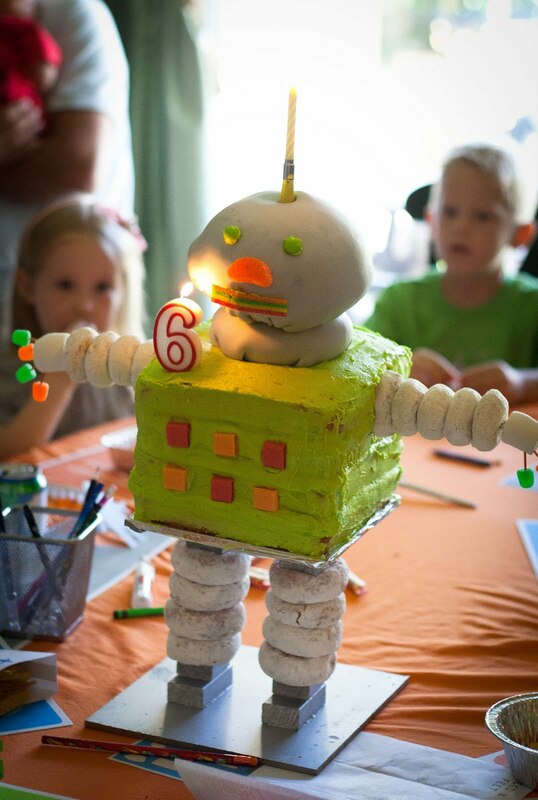 There is NO way I could make it look as cute as you did, but I'm gonna try for my son's 5th birthday coming up! Now. What can I get done in 2 weeks…? What an original party! I simply love it. I can see why this party would be your favorite project…. this is all amazing! And besides looking amazing, you did cute activities, too! Officially coolest mom. Would like to order your stand, how much? What a totally cute party! I love the make your own robot activity! My kids would love this! 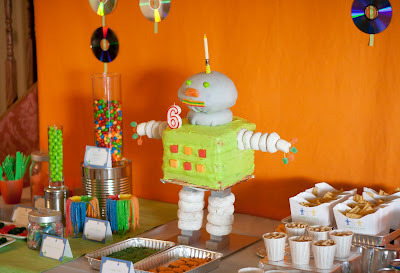 My son is turning 6 in two weeks and is currently obsessed w robots (let’s hope that doesn’t change before the party!) 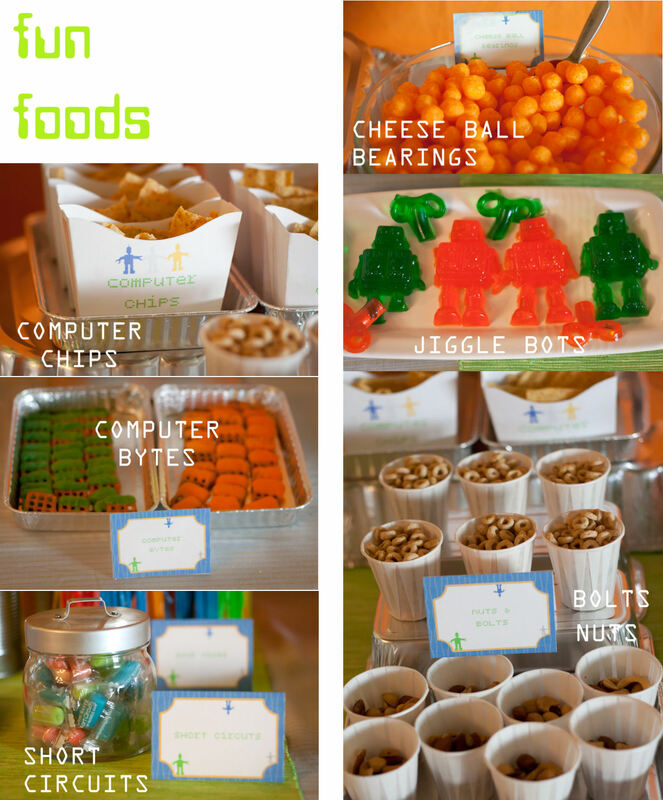 Every good idea I’ve ever had has been stolen, so I’m basically hoping to steal everything you did here for my sons party. But I need an intense amount of help! 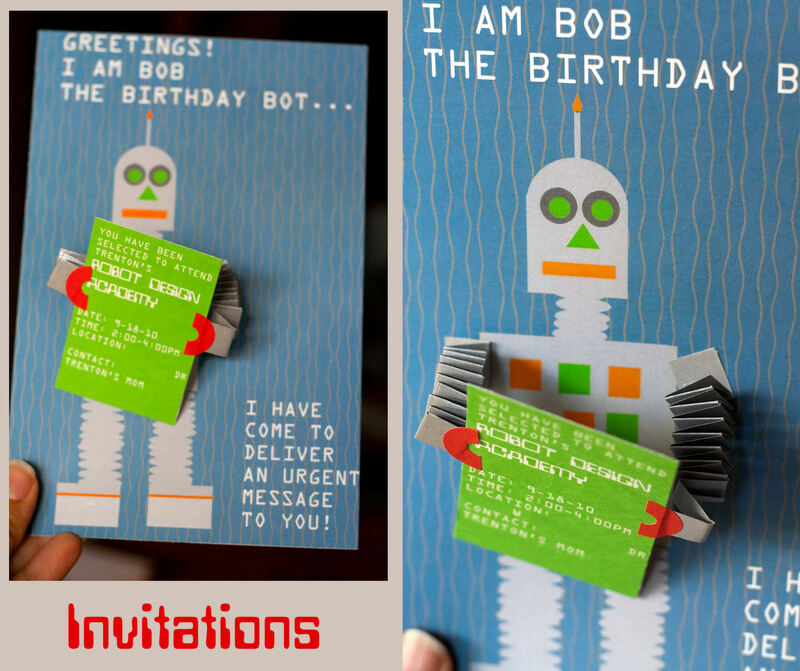 Any chance you have pdf files of the invites, labels, placemats and other printables for the the robot party? 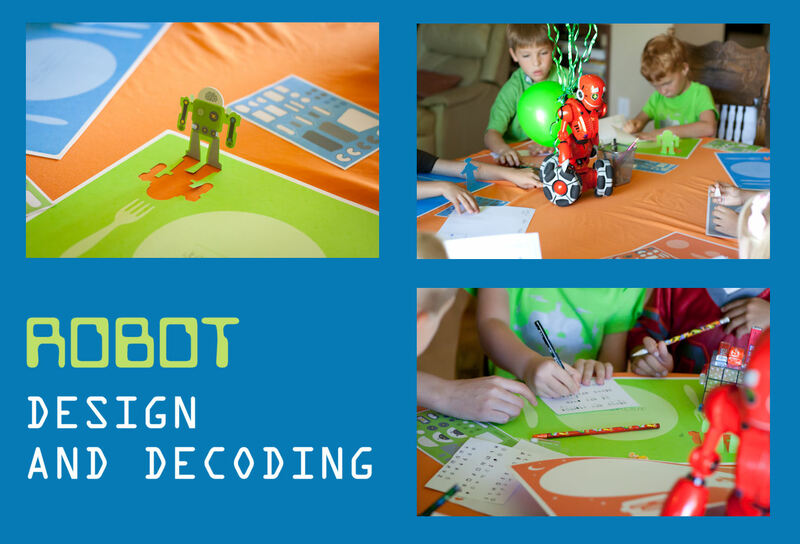 (And now I’m about to reveal how un-creative I really am…) What did the kids use to assemble their own robots – photo squares? Where did you buy the brisltebots, robot stickers etc? Basically any how to’s, where from’s, or what about’s you are willing to share would be greatly appreciated! Thanks for sharing your insanity and saving mine! Love the placemats. Where did you find those or how did you make them? 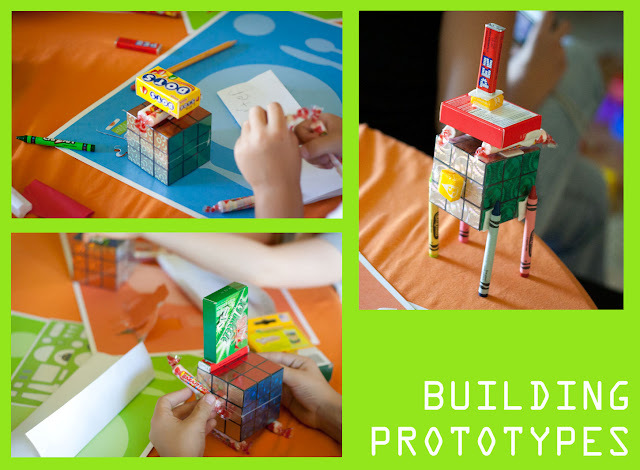 I am getting ready for my son’s 5th and we built on your idea (promise to give you credit :-)). Thanks. 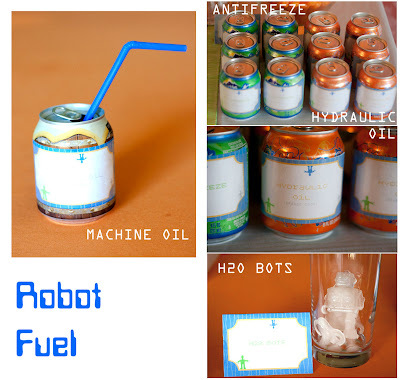 I blogged about the placemats here: http://meandmyinsanity.com/2010/09/robot-party-table-hello-hanna-giveaway.html They are by a company called Hello Hanna. I’d love to see how your son’s birthday turns out! Hey Kendra! I got your sweet comment on my blog; yes and yes! Thanks so much! How much for your stand?